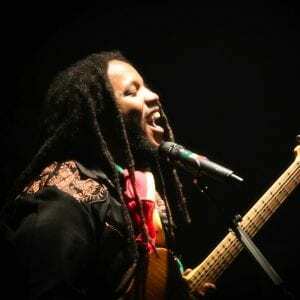 An eight-time GRAMMY winner, Emmy winner, author, philanthropist, and reggae icon, Ziggy Marley has released thirteen albums to much critical acclaim. Now with his own label, Tuff Gong Worldwide, and publishing company, Ishti Music, Marley has complete control of his master recordings and publishing. His early immersion in music came at age ten when he sat in on recording sessions with his father, Bob Marley. 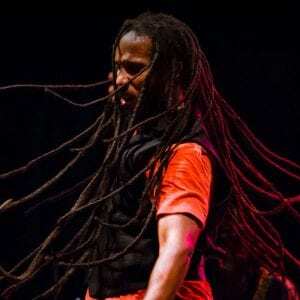 As front man to Ziggy Marley and the Melody Makers, the group released eight best-selling albums that garnered three GRAMMYs, Ziggy’s first solo album, Dragonfly (RCA Records), was released in 2003. 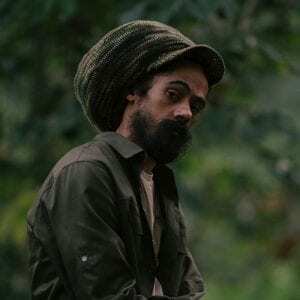 His second solo release, Love is My Religion (Tuff Gong Worldwide), won a GRAMMYin 2006 for “Best Reggae Album.” His third solo studio album, Family Time (Tuff Gong Worldwide), scored a 5th GRAMMY award for “Best Children’s Album. Ziggy’s fifth solo studio album, Fly Rasta was released to mass critical acclaim in 2015, and earned his 7th GRAMMY for “Best Reggae Album”. 2016 marked the release of Marley’s self-titled album, which garnered his 8th GRAMMY, as well as The Ziggy Marley and Family Cookbook, via Akashic Books. During Julian’s formative years in Jamaica, he began to study under legendary reggae veterans such as Aston “Family Man” Barrett, Carlton Barrett, Earl “Wire” Lindo, Tyrone Downie and Earl “Chinna” Smith, all of whom inspired the then fledgling song-bird. In 1996, Julian released his debut entitled, Lion in the Morning, which launched him into the public eye. The album was a conscious effort and culmination of his musical development to date and reflected Julian’s growing maturity and musical sophistication. Recorded at Tuff Gong studios in Jamaica, Lion in the Morning is Julian’s own testament that clearly reflects his roots and heritage. The record was followed by a successful International tour with The Uprising, which included performances in Jamaica, New York City, Japan, Brazil and Mexico. In 1998, Julian contributed a vast range of musical elements to singer Lauryn Hill’s Grammy Award winning album, The Miseducation of Lauryn Hill, including playing guitar on the single, “Forgive Them Father”. In 2003, Julian joined his siblings Stephen, Cedella, Damian, and Kymani to contribute a version of the single, ‘Master Blaster’ for Stevie Wonder’s tribute album entitled, Conception: An Interpretation of Stevie Wonder Songs. That same year, Julian also recorded his sophomore effort entitled, A Time and Place at the Lion’s Den in Miami. An organic fusion of rootical reggae and jazz, A Time and Place was produced by his brother Stephen Marley, and the album cemented Julian’s next milestone on his artistic path. 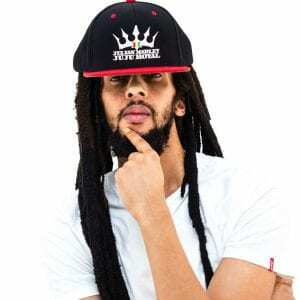 In 2009, Julian Marley’s career rose to new heights with the success of his Grammy Award Nominated release entitled, Awake released on Ghetto Youths / Universal Music Group. The thought-provoking album was co-produced with his brothers Stephen Marley and Damian “Jr. Gong” Marley and recorded at the Lion’s Den in Miami and the Tuff Gong studio’s in Jamaica. Julian’s ‘Awake’ world tour with The Uprising flourished in 2009, and stemmed into a major North American, Caribbean and European run that included the Raggamuffin 2010 tour of Australia and New Zealand. 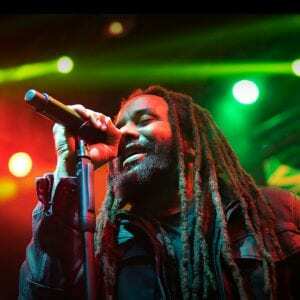 In May 2010, Awake took home the award for ‘Best Album of the Year’ at the International Reggae and World Music Awards (IRAWMA) in New York City. Marley’s tour with The Uprising continually expanded in 2010, and performance dates found Marley circling Europe, and scheduling back to back headlining performances in the UK, Greece and South America. Ky-Mani was born in Falmouth, Jamaica, but at the age of nine, he relocated to the inner-city of Miami. During his youth, Ky-Mani was unaware of his musical abilities, sports being his first love. With his mother’s direction, he took piano and guitar lessons and played trumpet in his high school band. In addition to tapping into his musical talents, Ky-Mani was an athlete, competing in soccer and American football. As a teenager, Ky-Mani started rapping and deejaying; his first single was “Unnecessary Badness”. He became inspired as a singer after being asked to sing a hook to a song during a recording session at a studio in Miami. Ky-Mani soon began experimenting with laying tracks, at times with his brothers, Stephen, Julian and Damian. Ky-Mani signed to Shang Records where he recorded his debut album in 1996 titled Like Father Like Son, and several singles: “Judge Not” with Patra, followed by “Dear Dad” (which topped the British reggae charts), “Who The Cap Fit (remix)”, and “Sensimelia”, all of which added to his growing reputation as a master in the new generation of reggae musicians. In 1997, Ky-Mani joined forces with Praswell (Fugees) on a hit cover of Eddy Grant’s “Electric Avenue”. Marley appeared at Midem (international music showcase), when it was held in Miami for the first time. In the Cameo Theatre, Marley performed a set which was aired live by the Caribbean News Agency to 36 countries. Marley became the subject of a bidding war. He signed with Gee Street/V2 Records in 1997 where he completed a collaboration with label mate P.M. Dawn on the single “Gotta Be Movin’ On Up”. Marley’s next recording was the 2000 release, The Journey. In 2001, he released his third studio album Many More Roads. He then went on tour and in 2004 and released his fourth studio album, Milestone. In 2007, he released Radio. Marley played the lead role in the number one underground movie coming out of Jamaica, Shottas, directed by Cess Silvera, co-starring Spragga Benz and Paul Campbell. He went on to play the lead, Kassa, with co-star Cherine Anderson in One Love, a romantic comedy.